Orange has seen the success such firms as The Carphone Warehouse have had from offering PCs with a broadband package and has decided it wants a piece of the action. By signing up to a 24-month contract, Orange broadband users will get a laptop courtesy of HP or Asus, which the network operator has signed up to provide the hardware, according to PC Retail magazine. 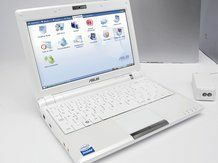 The little powerhouse that is the Asus EEE 900 PC will be available with the £25 a month contract, while higher end HP offerings can be garnered for around £35 to £45 every 30-odd days. Francois Mahieu, devices director at Orange UK, confirmed to PC Retail the company was looking to improve its range of offerings by launching the service. "Over time, we will be looking to expand our offering even further with more suppliers who are at the forefront of laptop technology, making it even easier for our customers to connect to the internet seamlessly, whether it is for work or play." Get your Asus from either Orange retail outlets or its website, or call up for the HP business models if you're that way inclined.